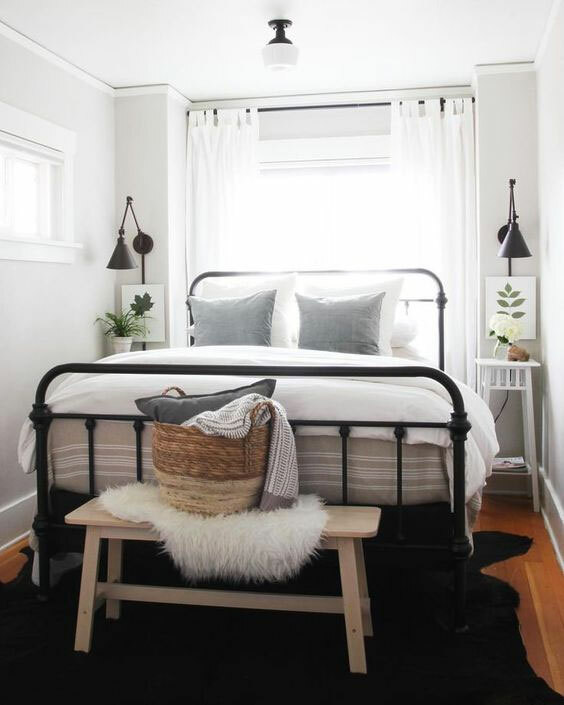 Tips on how to make your Small Bedroom comfortable and convenient. Take note of the measurements and write them down on your notepad or jot it down to your iPad/ tab. You’ll be using it as a reference later on. While you are at it, take note of the available outlets inside the room. You’ll need the information once you start arranging your furniture. The bed is usually the biggest furniture in the bedroom. Meaning it will take up more space than the rest. That being said, the bed should be the first thing you need to consider when arranging the furniture in small bedrooms. Once you know where it should be placed, arranging the rest of your furniture will be a whole lot easier. Pro Tip: Place the bed lined up against one wall on the opposite side of the doorway. Or if you still have more room, place it on the centre of the most visible wall. Make sure that you have enough room alongside the bed to easily get up and get in. 3. Optimize your clothes’ space. The next thing to go inside the room is the dresser. If you still have space, tuck your chest or dresser in the closet. You’ll have more room for the rest of your stuff and all your clothes will be located in one area. Pro Tip: Remember to keep enough space between the dresser or your closet that you can open all drawers and doors. 4. Let the smaller furniture in. Once your closet/ dresser is inside, it is now time to focus on the smaller items like nightstands and desk chair. When arranging item, take this opportunity to eliminate unwanted furniture and de-clutter your stuff to save up more space. When everything is settled in, try moving around the room. For example, try going into the bed and getting up. You may also try to open drawers and closets and even sit down on your desk chair. Make sure that you don’t bump into something when you move about. If you do, then you may need to rearrange the furniture again for a more convenient movement around the room. Now that we have covered the ways to fit in furnitures, next is to find the appropriate layout for your small bedroom. The L-Shaped layout is an arrangement where the furniture is lined-up along two walls of a square bedroom. This type of small bedroom layout creates a cozy corner for the occupants to enjoy in. It also opens up the rest of the room and makes the space feel less boxy. 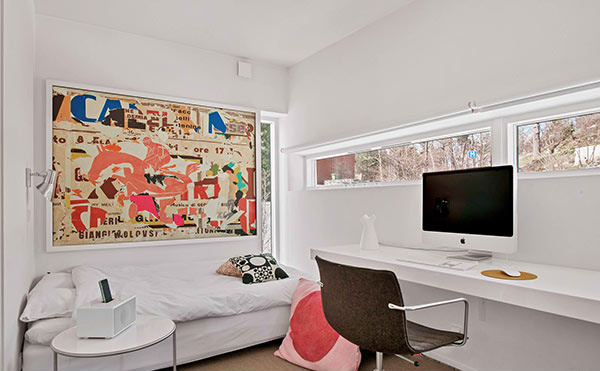 The Long layout is an arrangement wherein the bed and the desk are lined up in a row along the same wall. This small bedroom layout helps to clearly define the sleep and work areas. 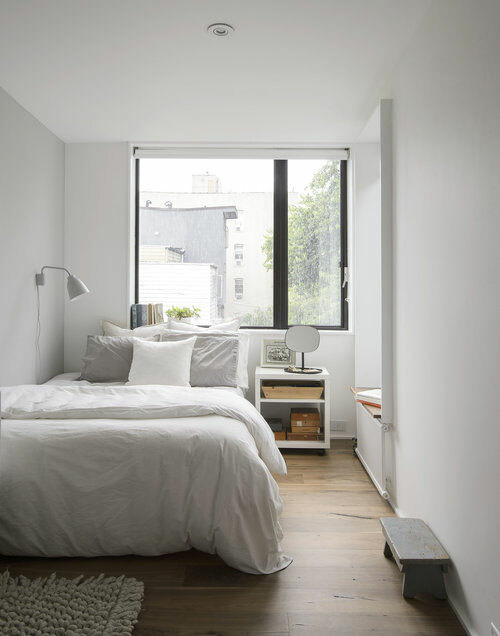 One of the most preferred colours when painting a small bedroom is white. As it is believed that white makes the room looks larger. While this can be true, stark white can make any bedroom feel cold. If you want, add some wallpaper on your room walls too to brighten it up. Remember to use large-scale patterns and place it to a focal wall, like your headboard wall. Don’t forget to coordinate the colours to your beddings too! For colour selection, here are some varying shades of colour that you can use for your bedroom! Deep colours on small bedrooms can camouflage the size of the space. The furniture, drapes and accessories should also complement that wall colour. You may also layer varying shades of the same colour in your trim, floors, rugs and windows. Pro Tip: Remember to stick with colours that make you feel comfy and cozy. 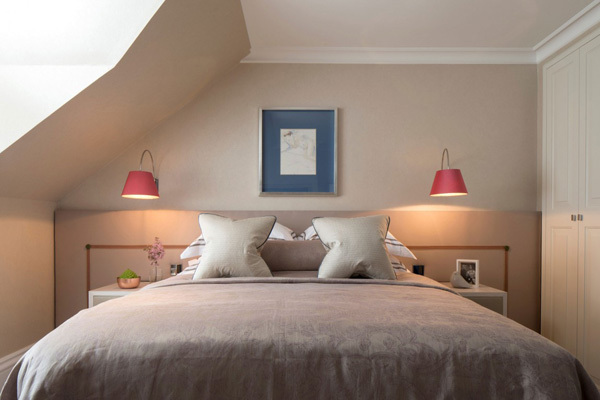 Earth tones and natural colours for small bedrooms are usually preferred to enhance the feeling of space. Neutral colours, in fact, can make the wall visually raced into the background. It also brings the attention to the accessories in the room. Soft tones like cream, butter and ivory are ideal choices to make the room feel bigger, but not too cold. You can layer complementary shades of white or some other favourite colours you love. Pro Tip: Stick to white for your ceilings as it makes the ceiling look more higher leaving the cramped feeling. 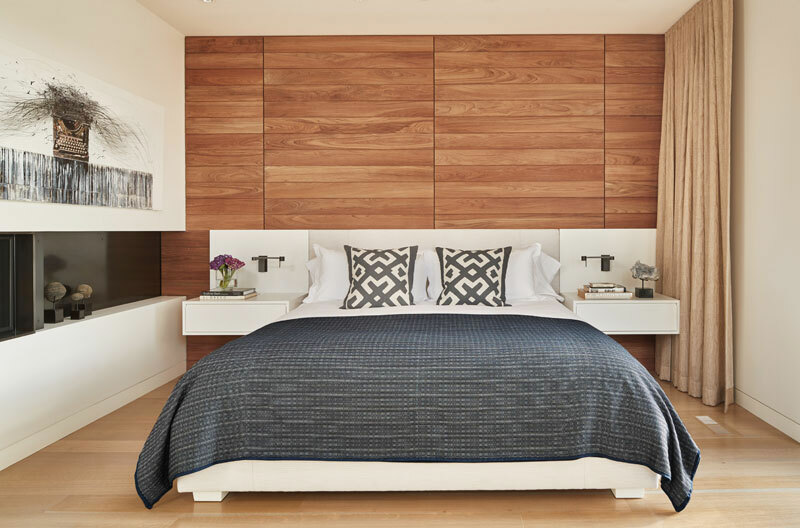 After figuring out how to fit furniture, bedroom layout and colour combinations, it is now time to decide what type of design you want for your bedroom. There are a lot of design ideas to choose from, depending on your preference. Below, we will just take a look at the more common and popular ones. Modern design for any interiors usually refers to the reflection of modern art in the home. Usually, the design themes are of clean straight lines, use of metal, lack of clutter and bold accent colours to name a few. Small bedroom at the Union Bay Residence in Seattle. The wall is accented in wood with a fireplace. 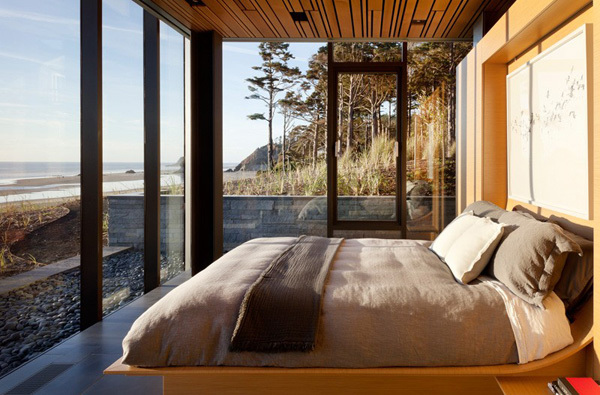 Transparent walls for wider spaces at this Beachfront Home in the Oregon Coast. The chandelier in the head side adds a comfortable touch to the interior. And it looks pretty charming too. This is one of the villas at Casa Hannah in Indonesia. The wall art in this room at a Stockholm Villa adds a soothing ambiance to the room. It also makes the space less small. Contemporary designs are more ‘of the moment’. The contemporary style features pieces softened and rounded. Most interiors contain neutral elements and bold colour and focuses on the basics of line, shape and form. Earth tones of various shades have been used in this room at the Residencia Mirante. 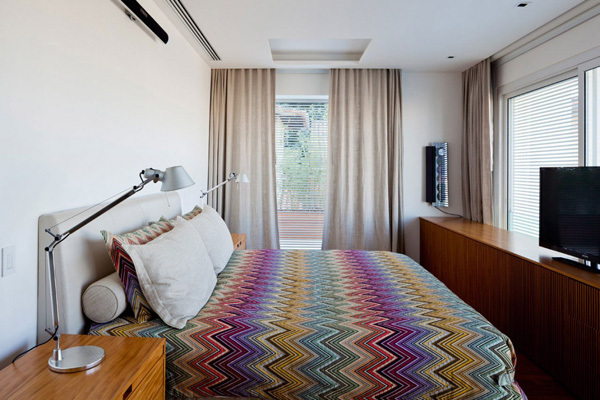 The colourful pattern of the bed adds a nice touch. 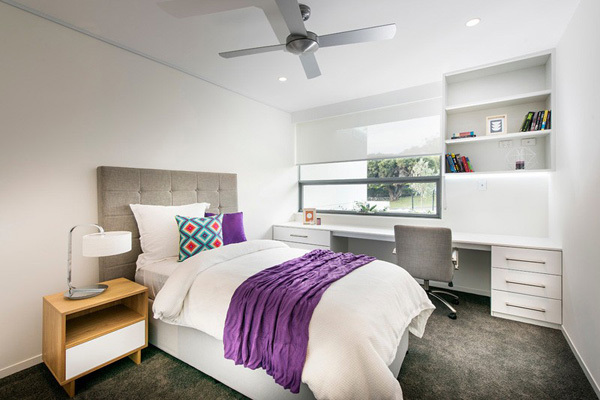 Add a touch of bright colour to liven up your small bedroom just like this room at a City Beach House in Perth. Put some lovely bright colours to your room and compliment it with other furniture just like this room at the Vernon Residence in California. 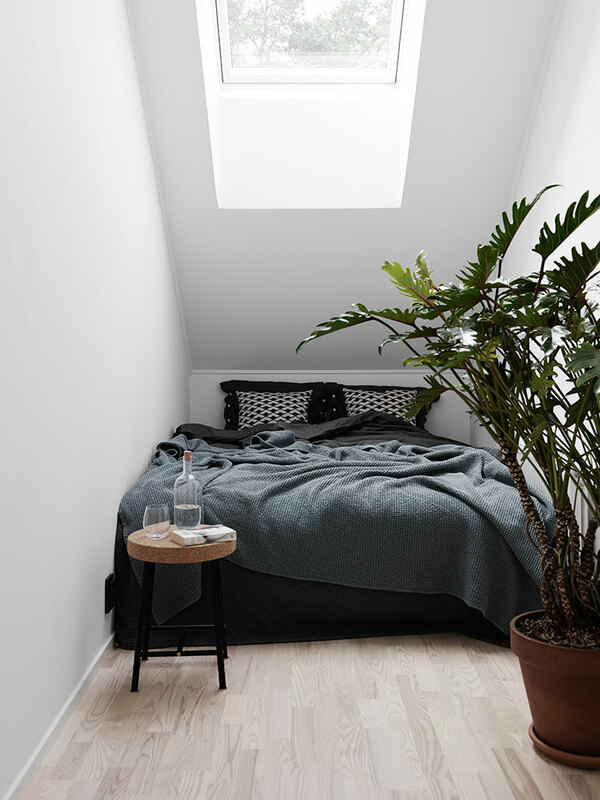 Small sleeping area at a garage-turned-home in Bordeaux. A skylight has been added to allow natural light. Minimalist style is often characterised by extreme spareness and simplicity. That being said, minimalist designs uses simple and natural forms. It commonly means spacious rooms with minimum furniture and details. Minimize furniture in your bedroom with only a bed and a small bedside table like this room at the Haus von Arx in Binningen, Switzerland. With the limited space of this room from Kristofer Johnsson, only a bed and a small stool for table has been added. 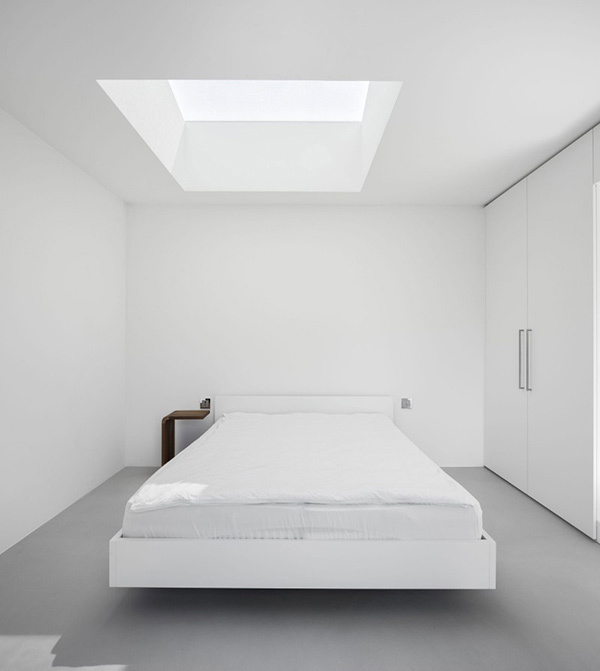 A skylight has been added right at the bedroom to make it appear more open. The room’s small white space from the Office of Architecture is maximised by minimising the furniture within the room and opening up the space at the centre for movement. Industrial design usually uses neutral tones, utilitarian objects and wood and metal surfaces. Often, the industrial interior designs have that ‘warehouse look’ with the few key traits that we love like the exposed pipes and ducts, woods and metal surfaces and vintage furniture and accessories among others. The use of the industrial lamps over the bed adds a bit more class to entire space. Plus the head board of the bed has been turned into a shelf for more space. Despite the bulky bed at the centre, the room from the Grit and Polish has been more open with the windows on the headboard. The chair and the basket at the other side of the bed, adds a nice touch to the interior. 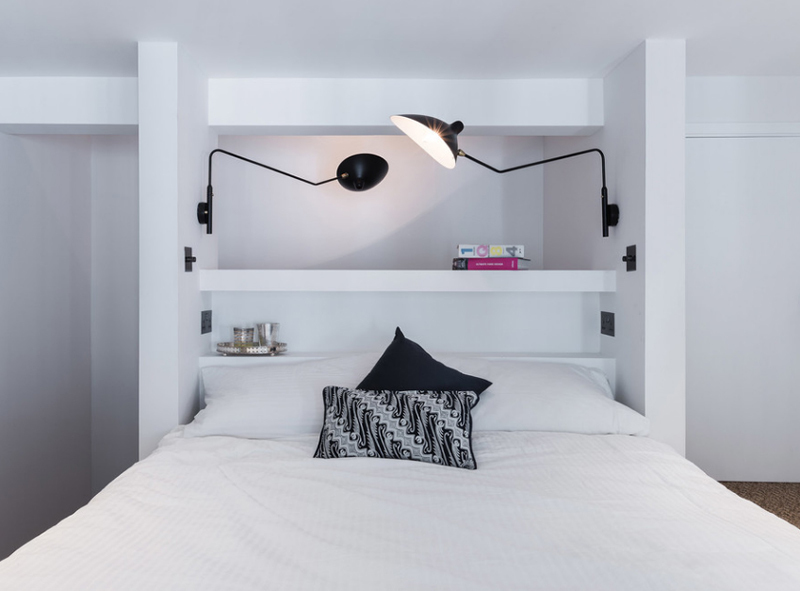 This New York Apartment has successfully combined the industrial design theme on this bedroom with the customised bedside table and bare walls. 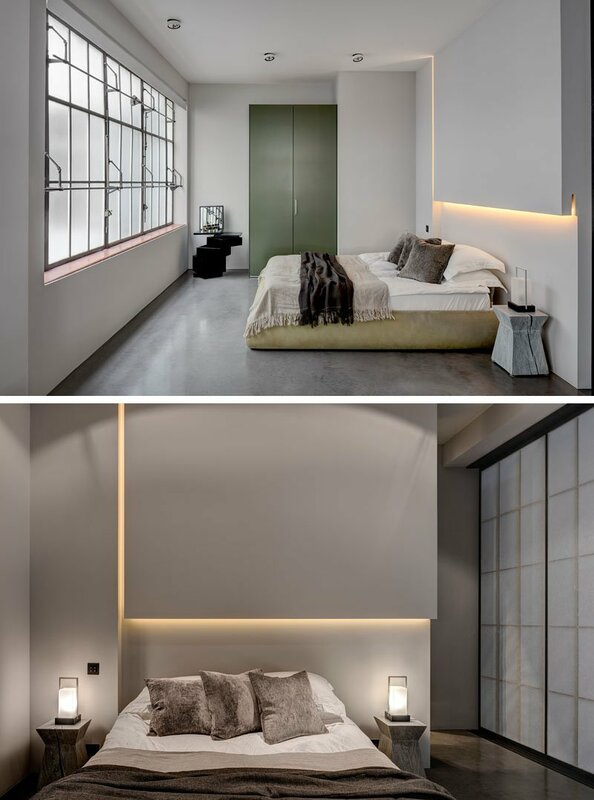 The room from an Industrial Apartment in London has made use of the industrial design concept with its edgy and rustic look. The furniture has been limited to the bed, bed tables, dresser and vanity table. This industrial bedroom makes use of metal finishes on most of the furniture and uses storage under the bed for keeping of things. If you are more of the classy and comfort type of person, the traditional interior design may just be right for you. 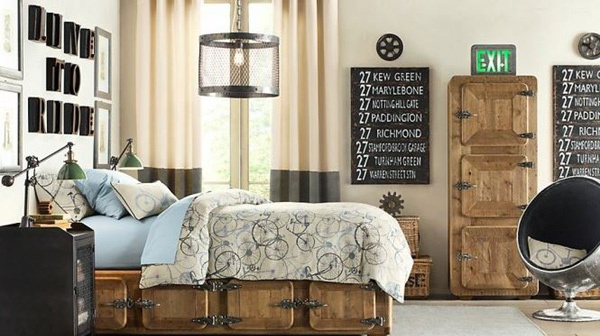 When you use the traditional design for your bedroom, you’ll be mostly using pieces that match and are consistent. The fabrics have the same patterns which can be florals, plain colours, muted plaids, geometric and small all-over patterns. If you are tempted, take a look at some examples of small bedroom design ideas for the traditional design. 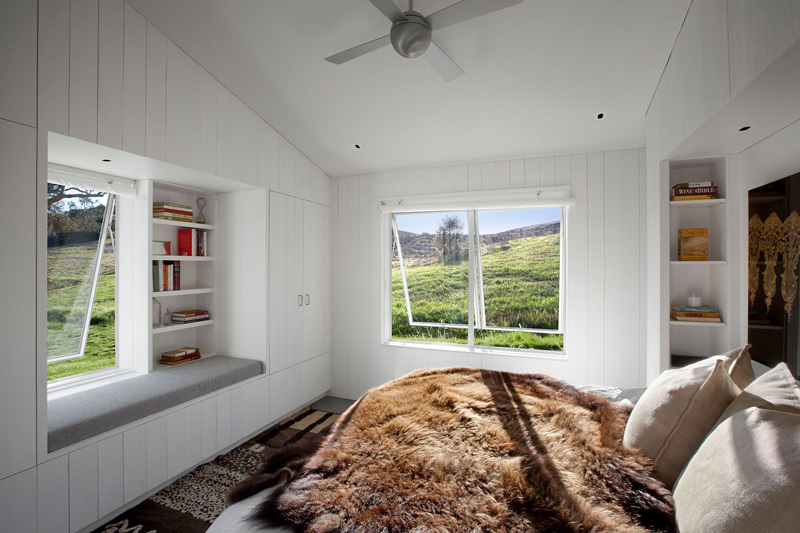 The room from Hupomone Ranch in California has custom-built window seat to add more space in the otherwise small space. 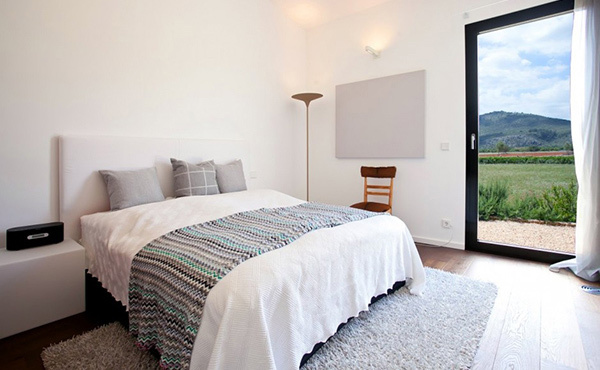 This bedroom from a pre-fabricated house in Mallorca plays around with the same colour-theme of the view from the outside (green) and added some gray touches. The room in this Cat Mountain Residence in Texas gives you a spacious feeling despite the limited space with its open window and chandelier. Another fantastic way to magnify space is the large open windows of this room in the Wheeler Residence in California. The Baby Pink and White combination of this bedroom idea for girls is rather cute and charming. The small pieces of furniture has been put aside to create a bigger space. The mid-century modern design can be very confusing on the specifics as to what period does it cover. But for designers, mid-century modern design are often characterised by timeless quality. The design is often identified to have clean lines and gentle organic curves. It also follows functions, uncluttered and sleek and with minimal ornamentation to name a few. This bedroom at the Bromptons in London is rather comfortable with the brown and earthy tones of the room accentuated by the red lamps. 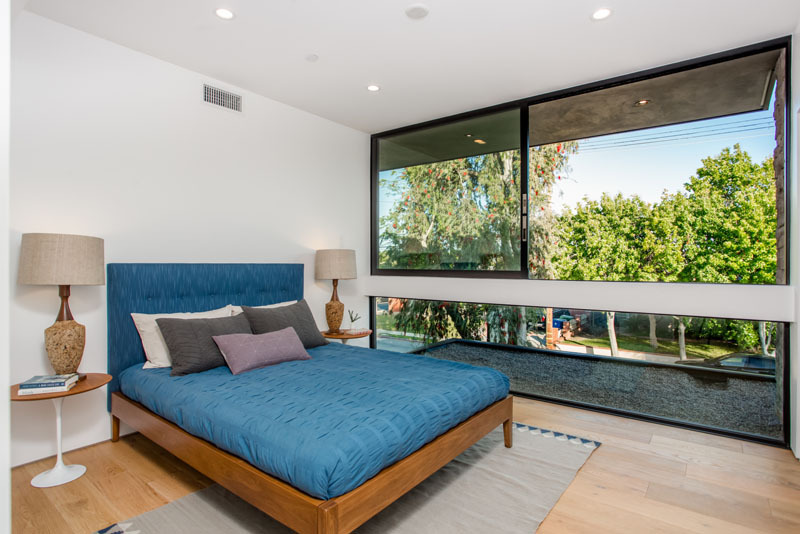 Another example of how windows like this bedroom at the Palms Residence makes a room look bigger. The limited space in this room at the Feldman House only has room for some chic furniture with an large window facing outside. This mid-century modern bedroom design makes use of wall niche and alcove to add more space to the room. Plus, the walls has been covered with photos to make it less bare. 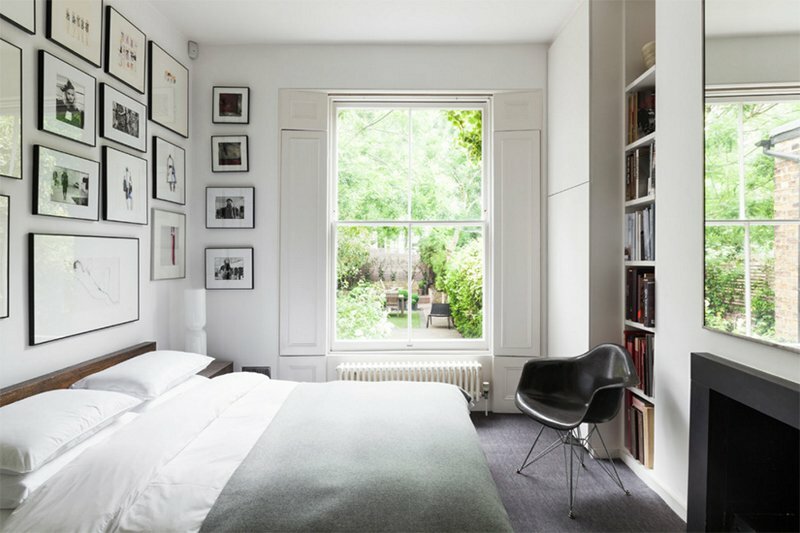 Don’t we all love it when we get to save space and ultimately fit in everything we want in our bedrooms? 1. Skip the bulky bed frame. No matter how much we love the design, forget the bulky bed frames. And this includes that king-size (or even queen) bed you want. Instead, use space-saving furnitures. 2. Add a rug in your bedroom. It can help make a small room look bigger. 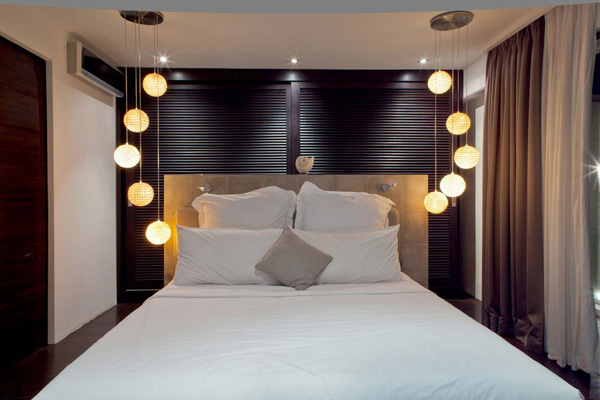 It also adds softness, and introduce colours or patterns that tie your small bedroom design together. 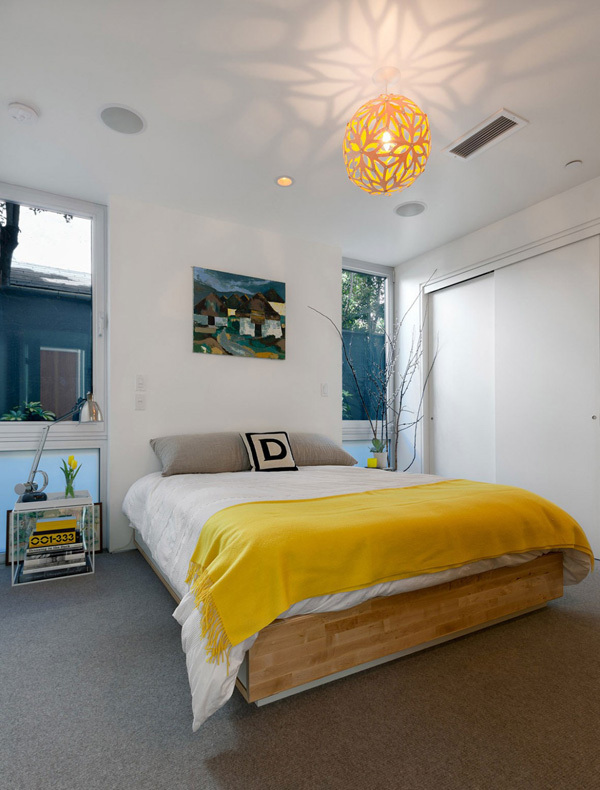 Design key points: if the bed is centered, slip the rug about 2/3 of the way under. If it’s in a corner, put the rug next to it or under another piece of furniture. Another good way to fit furniture in small bedrooms is by getting creative with storage spaces. In truth, the way you store your stuff is one of the keys to a great small bedroom design. Pro Tip: Use under-bed storage and custom-shelving to free up space. Store your little things like books, paperworks and footwear here. You may also look into dual-purpose storage-spacers like an ottoman for keeping your stuff and at the same time have some extra seats. Often we get sentimental with things, that we can’t help but keep them even if we don’t need it anymore. This also applies to when we keep things in our bedroom. Going minimal means reducing your stuff and leaving your favourite essentials. By doing so, you also adds space to your bedroom. Add more space (at least visually) with mirrors. You don’t need to have the floor-to-ceiling ones, body-length size or horizontal mirrors that are shoulder-length will do. 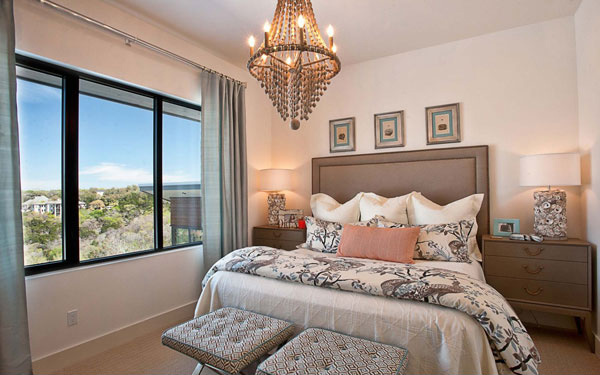 Pro Tip: Enhance the natural light in your bedroom by positioning a mirror to reflect the light of a window. For spaces with higher ceilings, you may consider adding a loft or platform for your bed with storage and/ or seating space underneath. Make sure that the person using the bedroom is willing to climb up and down just to go to bed, though. 7. Make use of floating shelves. Another space-saver are floating shelves. It will not take any floor space at all and will definitely be functional. Use it as a nightstand replacement, a bookcase, a laptop desk and so much more. 8. Create an alcove or wall niche. If your room is set up on non-exterior wall with wood beams inside, cut out an alcove for additional shelves. The space may not be too deep, but it can definitely give you more space for your small items. Small spaces can be very interesting to work on, especially if you love designing. But as they say, there are ways to work around it, as long as you have the right information and tools. Hope you have found this post helpful! We would love to see how you have made your small bedrooms efficient and fun! Share it with us!